Normally a race report should start with the start of the race, but, our race adventure started two days prior to the event. 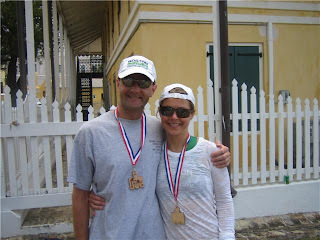 Long story short, we arranged our trip to St. Croix through Endurance Sports Travel, run by Ken Glah (turns out he will be doing his 26th consecutive Kona race this year). Ken and his two colleagues thought that a good pre-race activity would be to ride The Beast. Get it out of the mental way. The Beast is a .7mile "hill." The steepest part of the hill has a 27% grade. Very tough, and do-able. But what goes up, must come down, and unfortunately on the way down, Carolyn had a very nasty crash. I was riding behind Carolyn when all of the sudden she seemed to hit a loose rock, or hole, or something, and she swerved left and immediately did a head over heels roll at around 25mph. The initial assessment was that her body was intact, except her brand new pink helmet was crushed in on the left side, broken in six places. 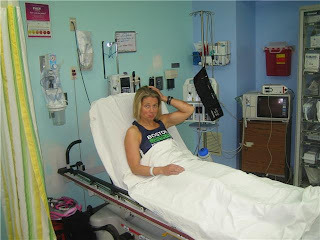 Many hours later in the emergency room and after a CT scan, the doc (from Rockland, MA) gave Carolyn the clean bill of health, and three bottles of hydrogen peroxide. So it seems that Carolyn amazingly took most of the crash, directly on her head...but that is not to say that she didn't get some quality road rash on every corner of her body (left and right shoulders, left forearm, left hip, left and right knees, but not a scratch on either hand). And her bike was not too worse for the wear; bent left brake handle and a bent saddle. Otherwise all good and all repairable. Saturday was the important day to "observe" Carolyn to make sure that she didn't start crossing her eyes, speaking in pig latin, or running around in circles - and she passed with flying colors. So fast forward to race morning. Carolyn was (mostly) in the game, now wearing an awesome Big Bird yellow helmet. So enough of the commentary and here are some of the details of the race. The whole race is based in Christianstead, next to the old fort. Christianstead is a classic old Caribbean town. Triangle swim in the clearest of clear water. I spied a lounge chair at about 40 feet on the bottom. Some fish. First leg of the swim is into the wind and current, headed out to sea. Second leg the opposite. Third leg is short along the town wall. The swim is quite tough and times reflect it. It is the first leg that gets you. Pretty choppy and hard to sight in the open sea. Hmmmm. Hard. That really is enough said, but I will give a few other details. The bike course is mostly beautiful. A lot of it is along the coast of the north and south sides of the island. And this is really where the word "relentless" comes in. To get through the bike course you have to battle wind, hills, heat, and a lot of really rough roads (not to mention 10 speed bumps). You just never get a break. Just when you round the east end of the island and think that the wind will shift to your tail, the road turns very rough and there are lots of short hills with turns. Or when you finally get a down-hill run that gets you over 30mph, you have to take a hard turn, left or right, requiring lots of braking because again, rough roads. And a quick tip given the rough roads, make sure everything on your mike is tightened down - my computer flew off at about mile 25, never to be seen again. The course was littered with bottles, nutrition, bottle cages, etc. There were a lot of crashes, mostly on corners. After the race, Carolyn wasn't the only person walking around looking like she had a fight with a weed wacker. Huge plus for the course were the number of race marshals and bike support crews (we know two people who broke their chains on The Beast, got help, and completed the race), and the fact that there were not any cars (didn't pass one). Oh, and there were four water stops. This part of the race was referred to as "a suffer fest," and I think that this sums it up. Two loop, out and back. Approximately 2 miles out on a road, 2 miles in the Buccaneer Resort around the golf course, and then 2 miles back on the road. The course is not too hilly, but there are a few short steep climbs. The sun was tough and for this part of the race - HOT. The run support was great. Water stops every kilometer with everything available including lots of ice, ice water, and iced sponges. The post-race party was great. Most of the competitors were there and the venue was a beach-side pool area. Kona and Clearwater slots were awarded while we all sat around the pool, sipping good drinks under a clear, 80 degree sky. In conclusion, we think that BTT needs a bigger presence next year. While this report may sound a bit harsh, we think that the St. Croix 70.3 really captures a lot of what triathlon is all about. Somewhere along the highway on the south side of the island, battling into the head winds, going all of...?mph, I swore this was a once and done race, but when I crossed the finish line I realized that I had learned a lot about the course and there is some elusive draw to come back to try and best mother nature, the course, and/or The Beast. (Or maybe it is the draw of the great rum punch). This coming weekend is BTT Team Weekend up at Waterville Valley (members only). I'll leave you with these parting thoughts: Throw out your worries and concerns about not being able to do a certain distance on the bike or about getting dropped. Team Weekend is a chance to test yourself with your teammates. If your longest ride is 40 miles....then head out with the 60 or 80 mile group and see what you can do. If you've never done a century, here's your chance. There's nothing like the end of the day commiserating with your teammates over the day's sufferfest....or bragging about it (especially over some cold ones)...whatever the case may be. We've all been "dropped" up there...it's not a big deal. So don't worry about the length or difficulty of the ride, embrace it!